A teacher or coach's job is to teach their students. Teachers and coaches are evaluated on their ability to effectively teach their students new skills. 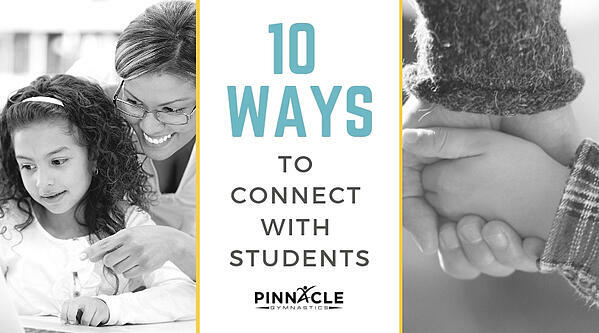 Many teachers focus so intently on getting straight to teaching that they miss one of the most important and meaningful ways to teach: make a sincere connection with their students. The more connected a student feels to their teacher, the more interested they will be in what their teacher is telling them. Kids need to know that the adults in their lives care. Not just care that they are teaching well, but care about their students as people. Learn more about Coaching Education here. Nicholas Provenzano, also known as the Nerdy Teacher, is an award winning educator. In his post titled "The First Five Minutes", Provenzano writes how the first five minutes sets the tone for the entire class. He noticed that when he started teaching right away that his students were not mentally prepared to learn yet. They were extremely talkative and unfocused. Instead of getting frustrated with his students and making the situation worse, Provenzano decided to take a different approach. He used the first five minutes of each class to ask his students questions, allow them to talk with classmates, and for everyone to get caught up with each other. At the end of the five minutes, Provenzano found that his students were more focused and ready to learn. He was able to teach them more information in a shorter amount of time. This might be one of many keys to classroom management. Another great result of the five minute chat time was that Provenzano learned a great deal about his students and was able to make meaningful connections with them. The first five minutes can be just as effective for coaches as it is for teachers in a classroom. Depending on how long class or practice lasts, five minutes can seem like a long time. 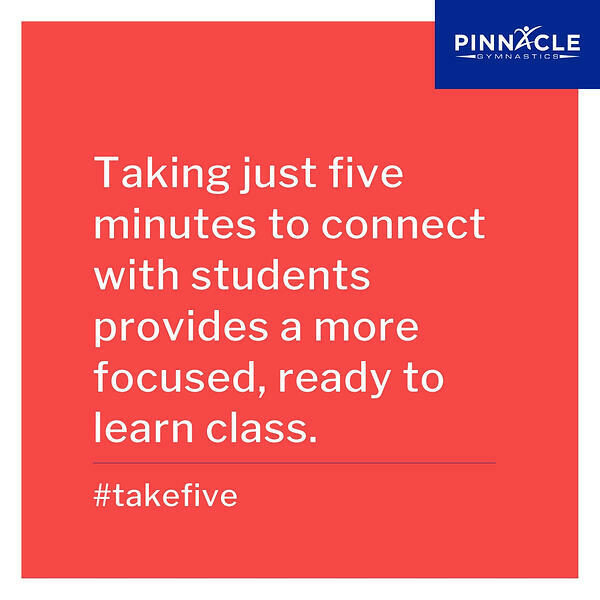 A great way to help with this seemingly wasted time is to also take attendance during the five minute talking time. Educators and coaches can prepare any notes or questions they have for students on their roster and use the chat time for that as well. Introduce yourself - Simple and obvious, but telling a child your name can help them feel much more comfortable. Hold their hand - Younger children are often shy at first, and making the simple physical connection of holding their hand can make a huge difference. Say something silly or ridiculous - Children expect adults to be serious and boring. Catch them off guard by saying something crazy that an adult would not usually say. The surprised smiles will be completely worth it. Let them know what to expect - Adults like to know what to expect from a situation, and children are no different. A great way to earn trust and make connections is to give your students or athletes a quick run down of what to expect that day. Tell them something about yourself - Tell them your favorite color, favorite animal, or favorite food. Most of the time children will want to tell your their favorites too! Gentle persistence - It can take some children longer than others, patience and gentle persistence will be your friend. Play music - Music is a great resource. Most children's movies and television shows have great soundtracks. Play music, if you can, and watch as children's eyes light up when they recognize one of their favorite songs. Get to know popular children's movies and television shows - This can seem tedious and painful, but it will be an easy way for you to connect. Smile all the time - Having a friendly and open expression makes a huge difference. Just make sure that your facial expression is genuine. Children are crazy-good at identifying adults who are insincere. Listen - Make eye contact and really listen to what your students or athletes are telling you. If you can remember even just one of their favorite things, then that will go a long way towards making a meaningful connection. Making meaningful connections can make a huge impact on your ability to effectively teach or coach a child. It can often feel like a waste of time, but it can be one of the strongest weapons in your teaching arsenal. And while some children can take longer than others to become comfortable, it is always worth the time.